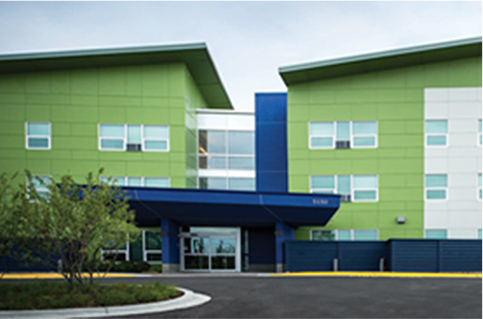 On June 13th OTR received the prestigious 24th Annual Charles L. Edson Tax Credit Excellence Honorable Mention Award in the Special Needs Housing Category. OTR received the award for our most recent development, Midtown Crossing Apartments, in Des Plaines, Illinois. Midtown Crossing was one of 14 developments to receive the award. The Edson Awards take place each year on Capitol Hill bringing together members of Congress with business and nonprofit leaders to honor Affordable Housing Tax Credit developments that strengthen communities, improve health, and boost the economy nationwide.Midtown Crossing offers individuals with mobility impairments and other disabilities maximum accessibility. Residents enjoy the convenience of a library/computer area, laundry facility, community room, and light-filled lobby alcoves on each level, as well as a central location just a few blocks from the Metra station, public library, downtown shopping, and restaurants. From design and construction to the quality of independent living — OTR pushes the boundaries with the Southwick Place development. Southwick Place was built to provide low income individuals with physical disabilities a premier affordable housing solution. The “barrier-free” apartments provide residents with maximum accessibility and self-sufficiency in the comfort of their own home. All 40 units on the site are designed to be fully accessible, featuring wider doorways, fixtures and switches at wheel chair height, roll under space at kitchen counters, appliances, bathroom sinks. and roll-in showers. 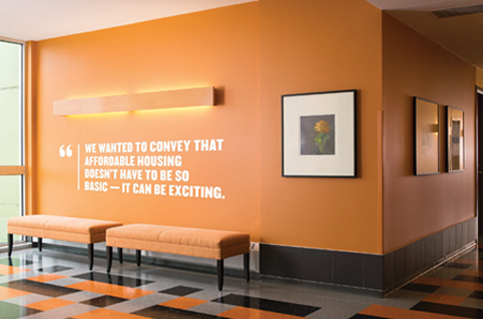 The public corridors are wider than standard and lead to open common areas decorated with original artwork. The expansive corridor windows bring in natural light and overlook landscaped grounds. The ground floor has a spacious community room with an accessible outside patio. Additional features include a library, computer area, laundry room, and an outside picnic pavilion. There is a great demand for this type of housing in the community and Southwick Place is a great addition to the Village. According to Eric Huffman, Executive Director of OTR, adults with mobility impairments who don’t have other options are spending thousands of dollars to retrofit their own apartments or condos. They still live with their parents, or they move into nursing homes at a young age because there is nowhere else to live. The supply of independent and accessible housing is just too scarce. “We’re hoping to change that,” he said. Stay in touch with the OTR community when you subscribe to our newsletter. OTR is an Illinois non-profit organization dedicated to providing independent living solutions for individuals with physical disabilities. @ 2017 OTR | All Rights Reserved.